Download "Robert Stark Life Settlement Data Request Form Connecticut"
14 Understanding Consider All Your Options Consumer Tips Life Settlements Find out if you have any cash value in your Understand how the process works and A life settlement is the sale of a life insurance policy to a third party. The owner of a life insurance policy sells it for a cash payment that is less than the full amount of the death benefit. 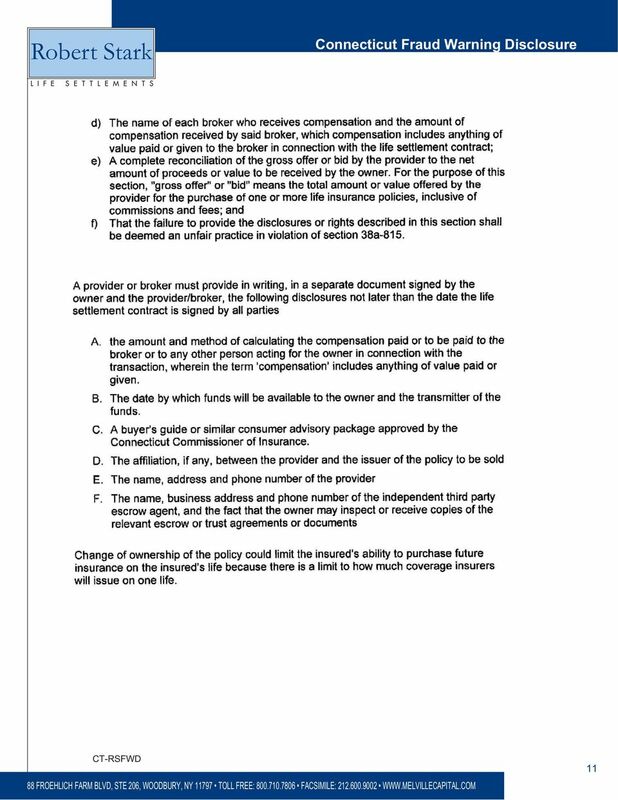 The buyer becomes the new owner and/or beneficiary of the life insurance policy, pays all future premiums and collects the full amount of the death benefit when the insured dies. People decide to sell their life insurance policies for many reasons. 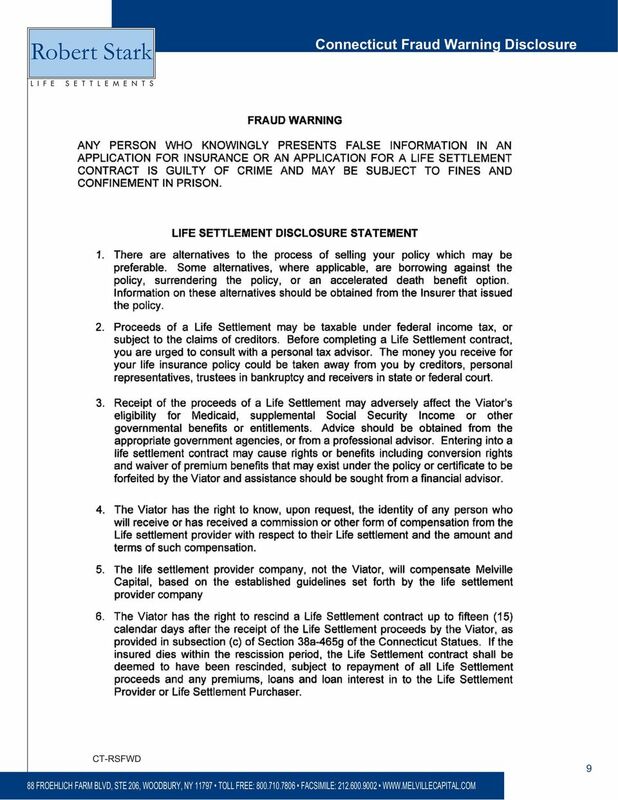 When an individual with a terminal or chronic illness sells his or her life insurance policy, that is known as a viatical settlement. When an individual who does not have a terminal or chronic illness sells a policy for other reasons, including changed needs of dependents, wanting to reduce premiums, and cash for meeting expenses, that is known as a life settlement. A life settlement may or may not be the right choice for you. 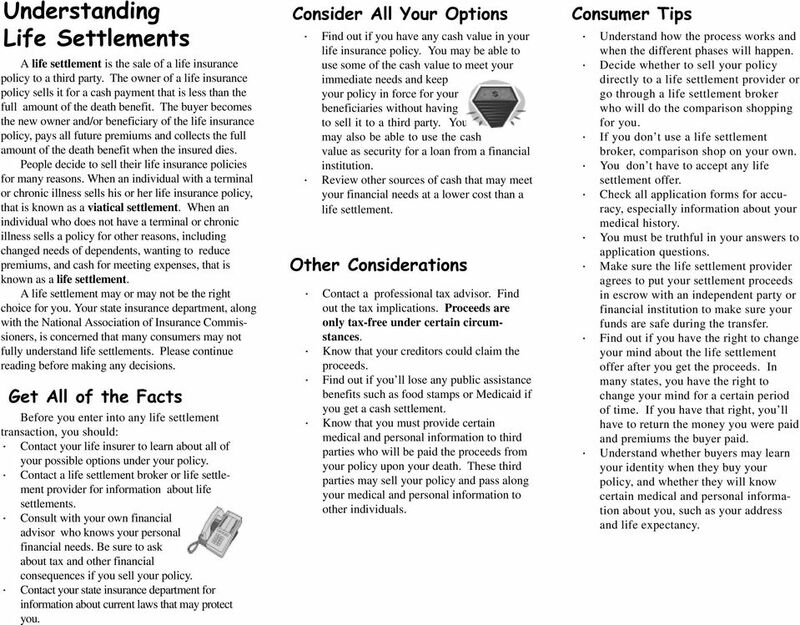 Your state insurance department, along with the National Association of Insurance Commissioners, is concerned that many consumers may not fully understand life settlements. Please continue reading before making any decisions. Get All of the Facts Before you enter into any life settlement transaction, you should: Contact your life insurer to learn about all of your possible options under your policy. 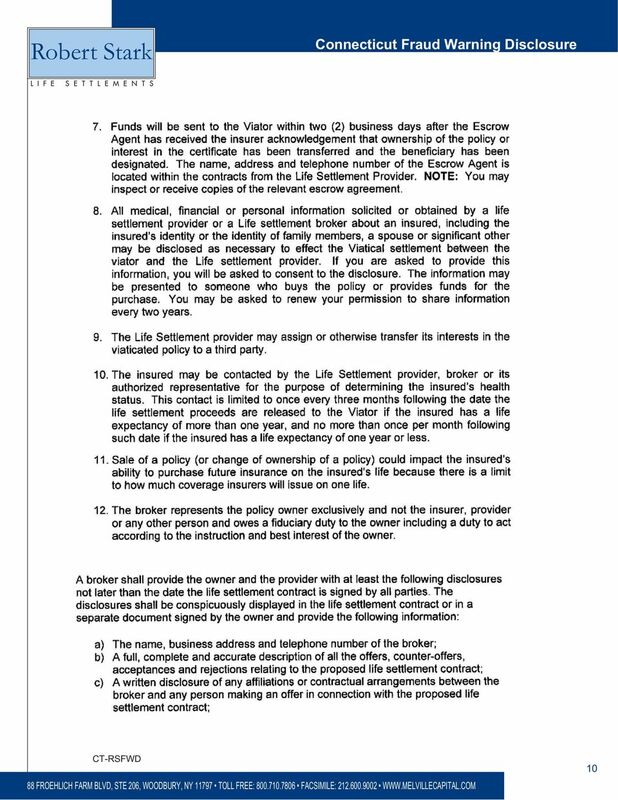 Contact a life settlement broker or life settlement provider for information about life settlements. Consult with your own financial advisor who knows your personal financial needs. 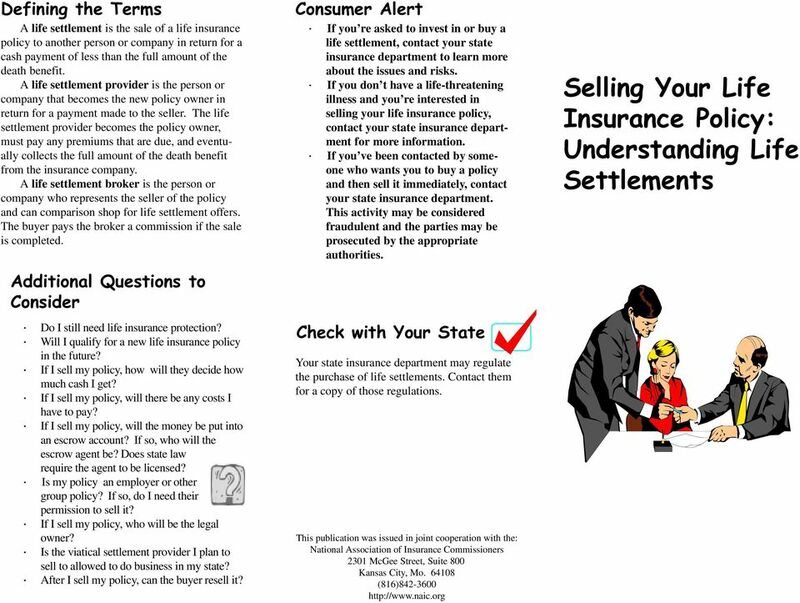 Be sure to ask about tax and other financial consequences if you sell your policy. Contact your state insurance department for information about current laws that may protect you. life insurance policy. You may be able to use some of the cash value to meet your immediate needs and keep your policy in force for your beneficiaries without having to sell it to a third party. You may also be able to use the cash value as security for a loan from a financial institution. Review other sources of cash that may meet your financial needs at a lower cost than a life settlement. Other Considerations Contact a professional tax advisor. Find out the tax implications. Proceeds are only tax-free under certain circumstances. Know that your creditors could claim the proceeds. Find out if you ll lose any public assistance benefits such as food stamps or Medicaid if you get a cash settlement. Know that you must provide certain medical and personal information to third parties who will be paid the proceeds from your policy upon your death. These third parties may sell your policy and pass along your medical and personal information to other individuals. when the different phases will happen. Decide whether to sell your policy directly to a life settlement provider or go through a life settlement broker who will do the comparison shopping for you. If you don t use a life settlement broker, comparison shop on your own. You don t have to accept any life settlement offer. 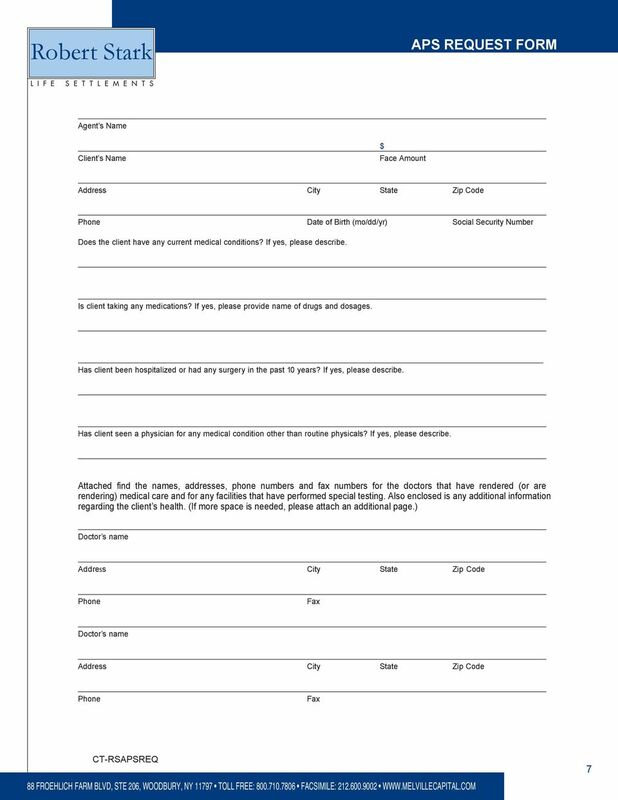 Check all application forms for accuracy, especially information about your medical history. You must be truthful in your answers to application questions. Make sure the life settlement provider agrees to put your settlement proceeds in escrow with an independent party or financial institution to make sure your funds are safe during the transfer. 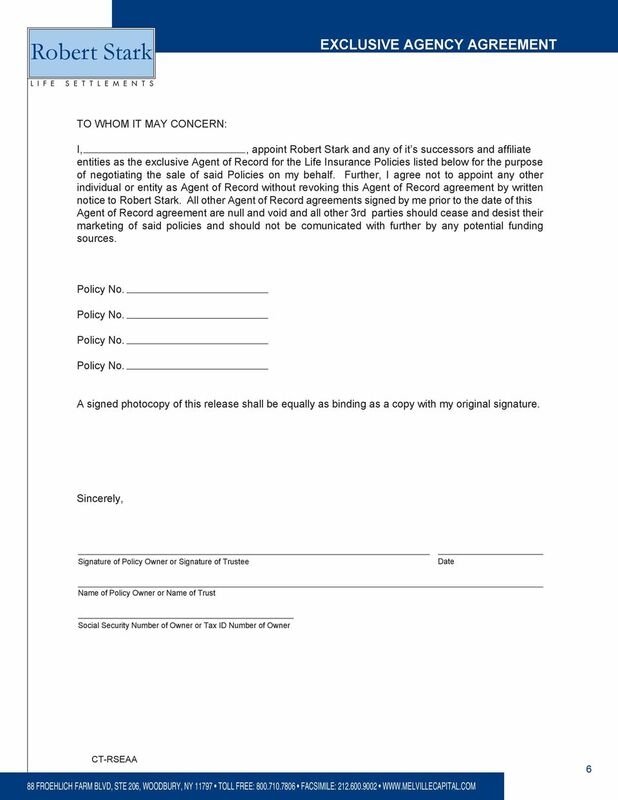 Find out if you have the right to change your mind about the life settlement offer after you get the proceeds. In many states, you have the right to change your mind for a certain period of time. If you have that right, you ll have to return the money you were paid and premiums the buyer paid. 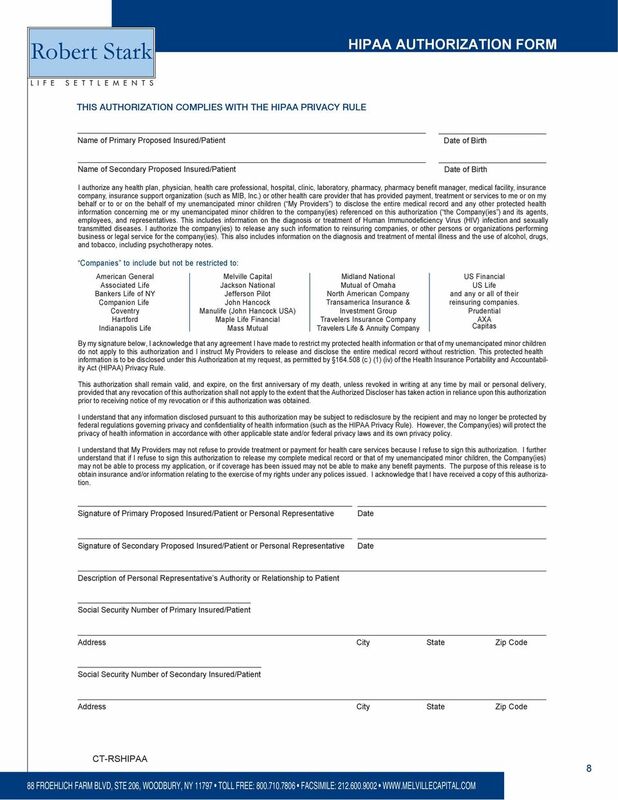 Understand whether buyers may learn your identity when they buy your policy, and whether they will know certain medical and personal information about you, such as your address and life expectancy. VIATICAL SETTLEMENT PROFESSIONALS, INC. LIFE SETTLEMENT BROKER 2 W. RUNSWICK DRIVE, RICHMOND, VA 23238 PH: 804-564-9469 FAX: 804-482-2728 www.vspi. On behalf of our company, we wish to express our sincere condolences on your loss. Your dermatologist has referred you for treatment of your skin condition. We would like to take this opportunity to welcome you and give you information that will make your appointment with us go smoothly. Please review the applicable anti-fraud statements on the reverse side of this form.